Abstract: Foot ulcers account for 15% of comorbidities associated with diabetes. Presently, no device allows the status of foot ulcers to be continuously monitored when patients are not hospitalized. In this study, we describe a temperature and a pH sensor capable of monitoring diabetic foot and venous leg ulcers developed in the frame of the seventh framework program European Union project SWAN-iCare (smart wearable and autonomous negative pressure device for wound monitoring and therapy). Temperature is measured by exploiting the variations in the electrical resistance of a nanocomposite consisting of multiwalled carbon nanotubes and poly(styrene-b-(ethylene-co-butylene)-b-styrene). The pH sensor used a graphene oxide (GO) layer that changes its electrical potential when pH changes. The temperature sensor has a sensitivity of ~85 Ω/°C in the range 25°C–50°C and a high repeatability (maximum standard deviation of 0.1% over seven repeated measurements). For a GO concentration of 4 mg/mL, the pH sensor has a sensitivity of ~42 mV/pH and high linearity (R2=0.99). High precision handheld infrared thermographic scanners and cameras can be used to measure ulcer temperature. However, these devices are expensive and measurements are limited to research purposes. Presently, no wearable device is available to continuously monitor the ulcer temperature. Similar consideration can be made for the measurement of pH as the market only offers handheld pH meters. This study describes the technologies and principles of the temperature and pH sensors that are under development in the SWAN-iCare project. We report the sensing materials under investigation and their early performances for a future use to fabricate wearable sensors for monitoring DF ulcers. Figure 1 The temperature sensor. Notes: Left: drawing of the Kapton substrate for the temperature sensor. Right: substrate with an electrode pair coated by a film of MWCNTs–SEBS. Abbreviations: MWCNTs, multiwalled carbon nanotubes; SEBS, poly(styrene-b-(ethylene-co-butylene)-b-styrene). We exploited the potentiality of graphene oxide (GO, Graphenea) to measure pH because this material changes its potential in water solution when the pH changes.32 Figure 2 shows the substrate used for the tests. A GO layer coated the working electrode (WE) of a screen printed-board (C220BT, 33×10×0.5 mm, Dropsens). This board has gold counter electrode (CE) and WE (diameter 4 mm), whereas the reference electrode (RE) consists of Ag/AgCl. The electrical contacts are in silver. The pH was measured as the change of the open circuit potential between the WE and the RE (Palmsens3, Palmsens). Five microliters of a GO dispersion in water was deposited onto the WE and let dry at room temperature. The sensor was compared with a commercial pH meter (Basic 20 by Crison with Micro P glass electrode by XS Sensor) in Hank’s Balanced Salt Solutions (HBSS; Sigma-Aldrich). Different pH values were obtained adding NaOH and HCl solutions. 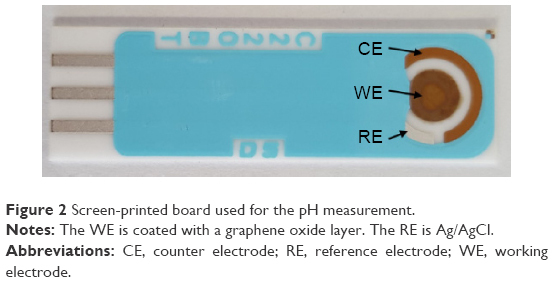 Figure 2 Screen-printed board used for the pH measurement. Notes: The WE is coated with a graphene oxide layer. The RE is Ag/AgCl. Abbreviations: CE, counter electrode; RE, reference electrode; WE, working electrode. As SEBS is an insulating thermoplastic elastomer that expands or shrinks with temperature, this effect lead to changes in the topology of the MWCNT network. Temperature affected the electrical resistance of the film due to two main concurrent phenomena. In the first place, MWCNTs change their intrinsic resistance with temperature. Different behaviors were observed in different kinds of carbon nanotubes (eg, zigzag and armchair),33 but the MWCNTs showed a semiconductor behavior with a decrease of resistance at increasing temperatures. In the second place, the electrical resistance changed due to the different thermal expansion coefficients of the insulating phase (polymer matrix) and the conducting phase (MWCNTs), that led to a rearrangement of the topology of the network at different temperatures. SEBS shows a small but significant percentage of crystalline phase that melts just above room temperature,29 reinforcing the rubbery character of the material. The mobility of the MWCNTs is enhanced in a more “fluid” polymer matrix, and this makes it easier for individual nanotubes to connect each other leading to the decrease of the resistance that had been observed within different measurement cycles.26 The relative importance of this contribution has been strongly reduced by the annealing treatment and paying the price of a reduced sensitivity to improve the stability of the films and to obtain more reproducible measurements. Figure 3A shows the transmission electron microscopy (TEM) image (CM12, Philips) of MWCNTs–SEBS after a sonication of 5 minutes. SEBS is not visible during TEM analysis; however, Figure 3A allows the good dispersion of MWCNTs in SEBS to be confirmed. Figure 3 TEM and SEM images of MWCNTs-SEBS and graphene oxide, respectively. Notes: (A) TEM image of a MWCNTs–SEBS composite after a 5-minute sonication. The MWCNTs are well dispersed (SEBS are not visible in TEM). (B) Scanning electron microscopy image of a graphene oxide layer. 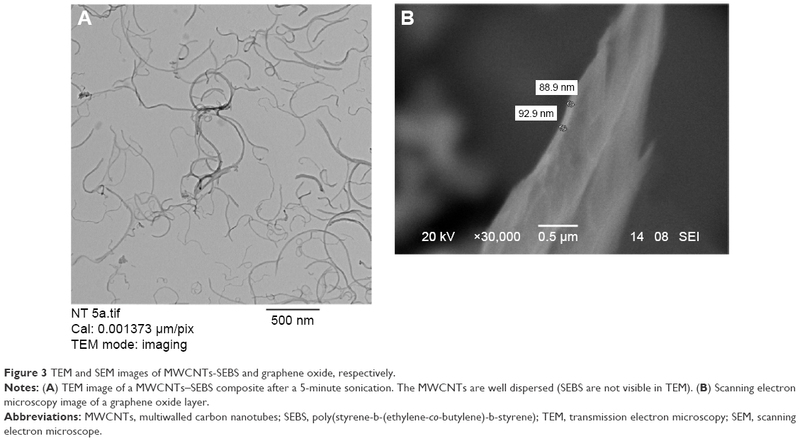 Abbreviations: MWCNTs, multiwalled carbon nanotubes; SEBS, poly(styrene-b-(ethylene-co-butylene)-b-styrene); TEM, transmission electron microscopy; SEM, scanning electron microscope. Figure 4 shows the calibration curve for an annealed nanocomposite MWCNTs–SEBS (20% w/w of MWCNTs) obtained over seven repeated measurement cycles, from minimum to maximum temperature and vice versa. The maximum standard deviation was 0.08°C in the interval °C. The sensitivity was ~85 Ω/°C, and the response time was 30 s/°C. The error calculated using this calibration curve was 0.3°C±0.2°C. 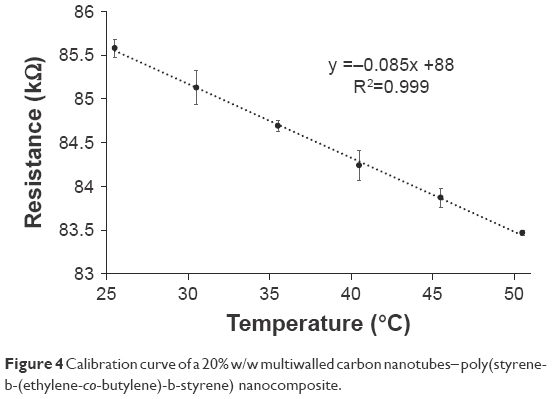 Figure 4 Calibration curve of a 20% w/w multiwalled carbon nanotubes– poly(styrene-b-(ethylene-co-butylene)-b-styrene) nanocomposite. We tested three different GO concentrations to assess the sensitivity to pH. Figure 5 shows the calibration curves for different pH values at GO concentrations of 0.04, 0.4, and 4 mg/mL. Figure 3B shows the scanning electron microscope (SEM) image (XL30, Philips) of a GO film (thickness ~90 nm) for a concentration of 4 mg/mL. In a recent study,34 we reported as the sensor was able to record pH over 3 days in human plasma. The same sensor was used after 20 days from immersion in plasma for another 3-day measurement campaign and observed a difference of only 0.14±0.09 pH units compared with the commercial pH meter (Figure 6). 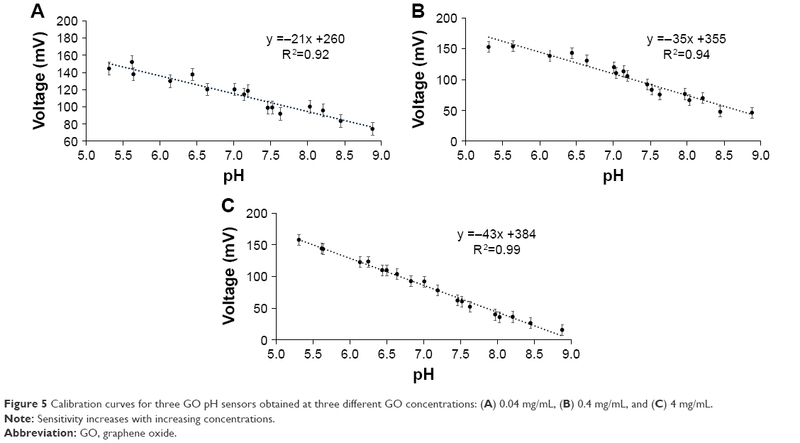 Figure 5 Calibration curves for three GO pH sensors obtained at three different GO concentrations: (A) 0.04 mg/mL, (B) 0.4 mg/mL, and (C) 4 mg/mL. Note: Sensitivity increases with increasing concentrations. 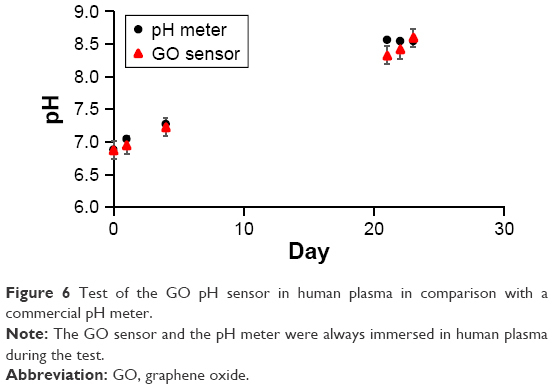 Figure 6 Test of the GO pH sensor in human plasma in comparison with a commercial pH meter. Note: The GO sensor and the pH meter were always immersed in human plasma during the test. In this study, we described two temperature- and pH-sensitive materials that may be used to monitor chronic ulcers status over time. The Kapton board is suitable to be used for tests with patients and part of future work will be dedicated to design a Kapton board where both sensors can be fabricated. Therefore, the possibility of introducing wearable sensors, eventually embedded in dressings or bandaging, for a real-time monitoring of variables such as pH and temperature in DF-ulcerated patients could help clinicians in improving the quality of treatments for such a complex pathology, specially increasing the timeliness of intervention, that has been demonstrated to be directly correlated to its effectiveness, both in terms of reduction of LEAs and healing of the ulceration.37–39 Future work will be to perform a randomized controlled trial, including a sterilization process for the materials; to confirm this hypothesis; and to validate this new technology with clinical evidence. This work was supported by EU-funded FP7 ICT-317894 SWAN-iCare project. Scully T. Diabetes in numbers. Nature. 2012;485(7398):S2–S3. Armstrong DG, Wrobel J, Robbins JM. Guest editorial: are diabetes-related wounds and amputations worse than cancer? Int Wound J. 2007;4(4):286–287. Prompers L, Huijberts M, Apelqvist J, et al. High prevalence of ischaemia, infection and serious comorbidity in patients with diabetic foot disease in Europe. Baseline results from the Eurodiale study. Diabetologia. 2007;50(1):18–25. Boulton AJ, Vileikyte L, Ragnarson-Tennvall G, Apelqvist J. The global burden of diabetic foot disease. Lancet. 2005;366(9498):1719–1724. Yazdanpanah L, Nasiri M, Sara Adarvishi S. Literature review on the management of diabetic foot ulcer. World J Diabetes. 2015;6(1):37–53. Akhtar S, Schaper N, Apelqvist J, Jude E. A review of the Eurodiale studies: what lessons for diabetic foot care? Curr Diab Rep. 2011;11(4):302–309. Apelqvist J, Larsson J. What is the most effective way to reduce incidence of amputation in the diabetic foot? Diabetes Metab Res Rev. 2000;16(Suppl 1):S75–S83. Calhoun JH, Overgaard KA, Stevens CM, Dowling JP, Mader JT. Diabetic foot ulcers and infections: current concepts. Adv Skin Wound Care. 2002;15(1):31–42. Prompers L, Schaper N, Apelqvist J, et al. Prediction of outcome in individuals with diabetic foot ulcers: focus on the differences between individuals with and without peripheral arterial disease. The EURODIALE Study. Diabetologia. 2008;51(5):747–755. Siersma V, Thorsen H, Holstein PE, et al. Importance of factors determining the low health-related quality of life in people presenting with a diabetic foot ulcer: the Eurodiale study. Diabet Med. 2013;30(11):1382–1387. Rice JB, Desai U, Cummings AK, Birnbaum HG, Skornicki M, Parsons NB. Burden of diabetic foot ulcers for medicare and private insurers. Diabetes Care. 2014;37(3):651–658. Texier I, Xydis S, Soudris D, et al. SWAN-iCare project: towards smart wearable and autonomous negative pressure device for wound monitoring and therapy. In: 4th International Conference on wireless mobile communication and healthcare (Mobihealth); Athens, Greece; Nov 3–5, 2014:357–360. Texier I, Marcoux P, Pham P, et al. SWAN-iCare: a smart wearable and autonomous negative pressure device for wound monitoring and therapy. In: IEEE 2013 International Conference on embedded computer systems: architectures, modelling, and simulation (SAMOS XIII); Samos, Greece; July 15–18, 2013:137–144. Salvo P, Dini V, Di Francesco F, Romanelli M. The role of biomedical sensors in wound healing. Wound Med. 2015;8:15–18. Lavery LA, Higgins KR, Lanctot DR, et al. Home monitoring of foot skin temperatures to prevent ulceration. Diabetes Care. 2004;27(11):2642–2647. Armstrong DG, Holtz-Neiderer K, Wendel C, Mohler MJ, Kimbriel HR, Lavery LA. Skin temperature monitoring reduces the risk for diabetic foot ulceration in high-risk patients. Am J Med. 2007;120(12):1042–1046. Dini D, Salvo P, Janowska A, Di Francesco F, Romanelli M. Correlation between wound temperature obtained with an infrared camera and clinical wound bed score in venous leg ulcers. Wounds. 2015;27(10):274–278. Houghton VJ, Bower VM, Chant DC. Is an increase in skin temperature predictive of neuropathic foot ulceration in people with diabetes? A systematic review and meta-analysis. J Foot Ankle Res. 2013;6(1):31. Roback K. An overview of temperature monitoring devices for early detection of diabetic foot disorders. Expert Rev Med Devices. 2010;7(5):711–718. Salvo P, Melai B, Bianchi S, et al. Non-invasive sensors for wound monitoring and therapy. In: Engineering in Medicine and Biology Society (EMBC), 37th Annual International Conference of the IEEE; Milan, Italy; 2015. Salvo P, Smajda R, Dini V, et al. A D-optimal design to model the performances of dressings and devices for negative pressure wound therapy. J Tissue Viability. 2016;25(2):83–90. McArdle C, Lagan K, Spence S, McDowell D. Diabetic foot ulcer wound fluid: the effects of pH on DFU bacteria and infection. J Foot Ankle Res. 2015;8(Suppl 1):A8. Nagoba BS, Suryawanshi NM, Wadher B, Selkar S. Acidic environment and wound healing: a review. Wounds. 2015;27(1):5–11. Martinez-De Jesus FR, Ramos-De la Medina A, Remes-troche JM, et al. Efficacy and safety of neutral pH superoxidised solution in severe diabetic foot infections. Int Wound J. 2007;4(4):353–362. Matzeu G, Pucci A, Savi S, Romanelli M, Di Francesco F. A temperature sensor based on a MWCNT/SEBS nanocomposite. Sensor Actuat A-Phys. 2012;178:94–99. Giuliani A, Placidi M, Di Francesco F, Pucci A. 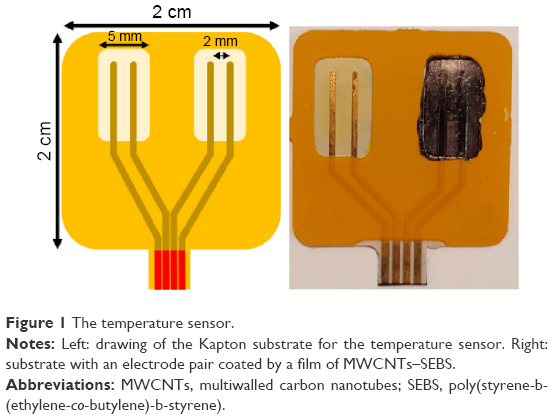 A new polystyrene-based ionomer-MWCNT nanocomposite for wearable skin temperature sensors. React Funct Polym. 2014;76:57–62. Biver T, Criscitiello F, Di Francesco F, Minichino M, Swager TM, Pucci A. Perylene bisimide/MWCNTs water dispersions for miniaturized temperature sensors. RSC Adv. 2015;5:65023–65029. Holden G, Legge CR, Quirk RP, Schroeder HE, editors. Thermoplastic Elastomers: A Comprehensive Review. 2nd ed. Munich, Germany: Hanser & Hanser/Gardner; 1996. Calisi N, Giuliani A, Alderighi M, et al. Factors affecting the dispersion of MWCNTs in electrically conducting SEBS nanocomposites. Eur Polym J. 2013;49(6):1471–1478. Shih CJ, Lin S, Sharma R, Strano MS, Blankschtein D. Understanding the pH-dependent behavior of graphene oxide aqueous solutions: a comparative experimental and molecular dynamics simulation study. Langmuir. 2012;28(1):235–241. Baughman RH, Zakhidov AA, de Heer WA. Carbon nanotubes – the route toward applications. Science. 2002;297(5582):787–792. Melai B, Salvo P, Calisi N, et al. A graphene oxide pH sensor for wound monitoring. In: 38th Annual International Conference of the IEEE Engineering in Medicine and Biology Society (EMBC); Orlando, USA; August 16–20, 2016:1898–1901. Chang TY, Yadav VG, De Leo S, et al. Cell and protein compatibility of parylene-C surfaces. Langmuir. 2007;23(23):11718–11725. Hsu JM, Rieth L, Normann RA, Tathireddy P, Solzbacher F. Encapsulation of an integrated neural interface device with Parylene C. IEEE Trans Biomed Eng. 2009;56(1):23–29. Wang K, Ruan J, Song H, et al. Biocompatibility of graphene oxide. Nanoscale Res Lett. 201;6(1):1–8. Mills JL, Beckett WC, Taylor SM. The diabetic foot: consequences of delayed treatment and referral. South Med J. 1991;84(8):970–974. Chantelau E. The perils of procrastination: effects of early vs delayed detection and treatment of incipient Charcot fracture. Diabet Med. 2005;22(12):1707–1712. Faglia E, Clerici G, Caminiti M, Quarantiello A, Gino M, Morabito A. The role of early surgical debridement and revascularization in patients with diabetes and deep foot space abscess: retrospective review of 106 patients with diabetes. J Foot Ankle Surg. 2006;45(4):220–226.